This is a placeholder as I re-engineer my home lab to new specs. I learned a lot going through this upgrade process, just as I did the last time I upgraded my home lab. I thought it might be helpful to others who are interested in building their own lab, or just as an interesting read for discussion purposes. I will start by building an index of what I upgraded and will add to it if people reply and ask questions. My latency to Tier 1 networks is excellent, and jitter-free. Last edited by attonbitusira; March 24, 2019 at 10:32 PM. 1u Dell poweredge r210ii w/ e3-1220 & 4GB of ram, currently doing nothing but once I've upgraded the RAM & CPU I'll be loading ESXi on it & running pfsense in a VM. 2u Cisco UCS-C210 M2 w/ 2x Xeon L5640 hexcores, 60GB of RAM & LSI-9260-8i raid card. ESXi 6.7u1 enterprise plus & vCenter host, going to be adding a mellanox connectx-2 NIC for 10gbe shortly. Also planning on adding 12x 5TB seagate drives for backups, and 4x 1TB SSDs for VMs. 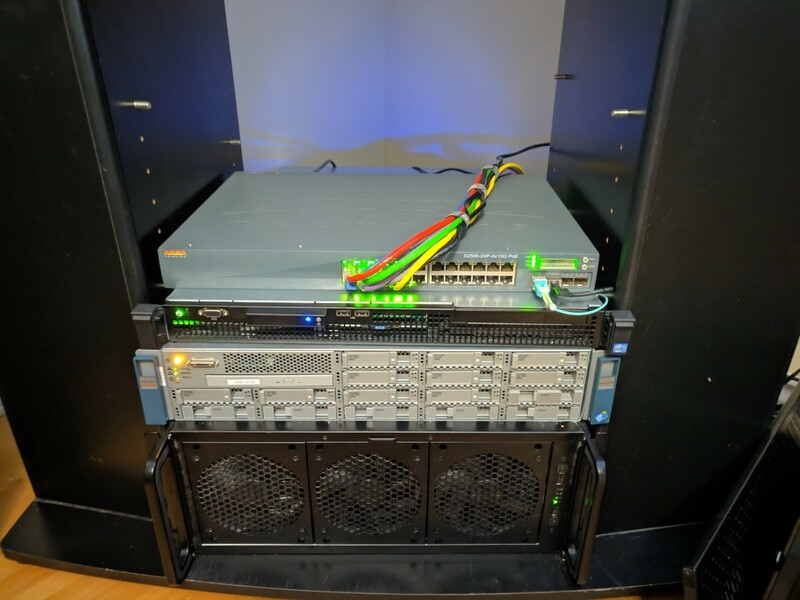 4u Rosewill case: Intel S5520HCR w/ 2x Xeon L5640 hexcores, 48GB of RAM, Dell Perc H200 flashed to a LSI 9211-i8 & Mellanox Connectx-2 10gbe NIC with 34TB of usable storage. This box is running unraid and serves as my VM storage/plex/media automation server. Eventually I will be moving this over to freenas for faster storage access & iSCSI support. Plan is to eventually get this up to 120TB of usable space. Not seen: Raspberry pi 3b running openvpn, cloudflare DDNS, pihole & NUT UPS server that all my other servers connect to, and a 1500va APC UPS.